I’m going to preface this by saying that I have no idea why Joss Whedon hasn’t always done Shakespeare. For those unfamiliar with the basic plot, Much Ado About Nothing is a comedy about two separate relationships and the people involved with both. Claudio (Clark Gregg) and Hero (Jillian Morgese) are at the heart of the story, and the innocence of their love and devotion is apparent in this remake, as well as the purity of Hero’s character. The other couple is comprised of Hero’s cousin, Beatrice (Amy Ackers) and Claudio’s close friend/battle pal, Benedick (Alexis Denisof). Both are too intelligent and sharp-tongued for their own good, and the two have an existing love/hate relationship prior to the beginning of the story. 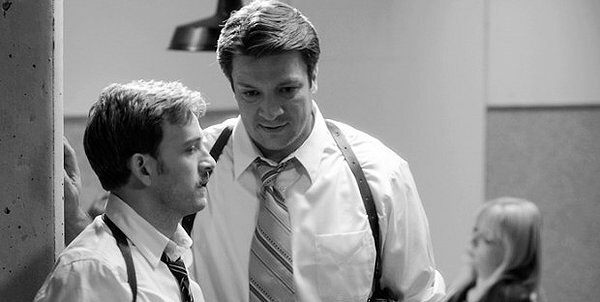 Ackers and Denisof have incredible chemistry, in both their love and their anger. When they were the only people on screen, it was hard for me to remember that this wasn’t just a weird, alternate universe, black-and-white episode of Angel. This is a good thing. The play’s themes focus on love, betrayal and devotion. Heavy themes for a comedy, but there are wonderfully hilarious spots throughout. 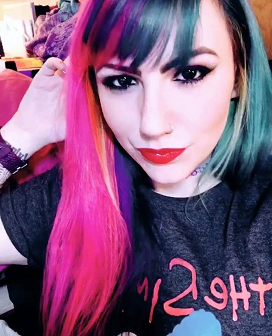 While part of the time is spent watching one of the characters sabotage the rest, equal screen time is devoted to other characters trying to bring two hardheaded lovers to confess their feelings for one another. Whedon’s choice to set the film in present day was a risk, but it worked out beautifully. The modern Elizabethan vibe in this adaptation is what stands it apart from its predecessors, and dare I say, above them. 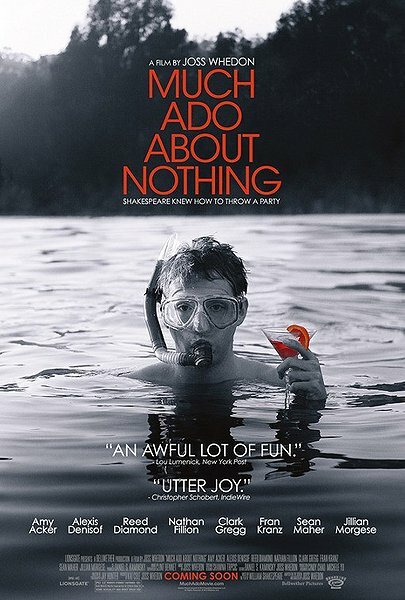 Although many diehard fans of Kenneth Branagh‘s version may disagree, Whedon’s Much Ado breathes an air of freshness and accessibility to one of Shakespeare’s funniest classics. Let’s also go through a quick run down of the cast, because we all know that Joss is infamous for using the same actors in everything he does — And for good reason. Displaying their range as actors as well as his own writing and directorial abilities, Joss Whedon doesn’t stick to one specific type of genre, as has been shown in his ability to deftly maneuver between them in his long list of titles worked on. A great deal of the comedic relief came from not only the constant bickering between Beatrice and Benedick, but also between Dogberry and Riki Lindhome’s portrayal of Conrade, which was actually written as a male character. Conrade was a follower of Don John rather than a lover of him, but watching an insulted and indignant Dogberry is so much like watching an insulted and indignant Mal Reynolds that my heart cried with happiness. The entire film was shot at Joss Whedon’s own home in Santa Monica, which is both kind of cool and kind of awkward — In one scene, the room is clearly decorated for a little kid, complete with a dollhouse and little dolls. It’s a little odd since none of the characters in the story have children, but it’s not something that really distracts from much else and it’s doubtful that those who are not so well acquainted with the plot and characters already will notice anything amiss. This film is Shakespeare done lightly, while also giving the full impact of having some of the wittiest and most clever banter between characters in history. A handful of American actors with either very little or no classical training, delivering lines of Shakespearean dialogue as if that were what they’ve always spoken. I would not have been so fluid, so props to them! I’ve read online rumors that Joss actually holds regular Shakespeare readings at his home, with close friends involved, AKA all the actors above as well as many other favorites from various other projects. I have no idea how one would go about being invited to these events, but let me just say right here, right now that if ANYBODY ever finds a way in, you are obligated to +1 me.